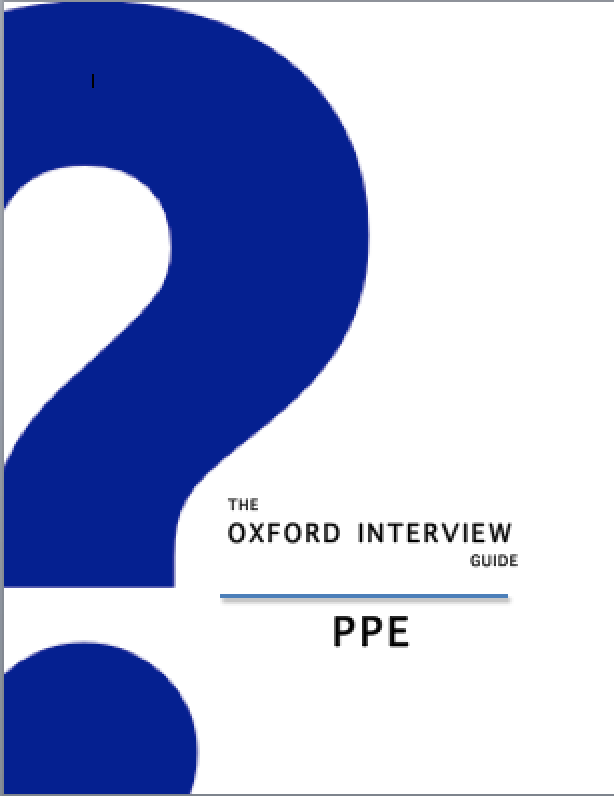 The PPE guide discusses Oxford Interview Questions in depth with answers and approaches – along with possible points of discussion to further demonstrate your knowledge. The PPE Guide also includes the Oxford General Interview Guide. It has been specially edited for applicants for each subject by a team of Oxford and Cambridge graduates. Download a sample page from the Interview Guide here. The Oxford PPE Interview Guide is available to download now! Order your Oxford Interview Guide online, and you’ll be sent it in PDF format by email the same day so you can begin your preparation right away. Click the button below to buy right now! Some Neoliberals say that poor people are poor because they are too lazy to work, what are your thoughts? Does the welfare state trap people into poverty? A new country is formed in Africa. They introduce a new currency. How does the international market value what it is worth? Does a balance of trade deficit matter? Why do you believe what your teachers tell you? Two trains are about to crash. One contains pensioners going to Blackpool. The other contains commuters going to London. Which do you save? Should prisoners get a vote? What is the strongest argument for and against? What other groups of people are excluded from getting a vote and why is that? How do you measure the success of a political voting system? Should a political party define ideology, or should ideology define the party? What are your top three skills? If you could meet anybody from history who would it be and why? If you had to choose a new language to learn, which one would it be and how would you go about it? What have you found most difficult at A Level and how did you overcome this? Tell me everything about you in 60 seconds. Tell me about a news article you have read recently that you found interesting. What do you think you could contribute to college life? We are continuing to add titles to our range of Subject Interview Guide. Other subjects will be available for download shortly – please enter your email below to receive a notification when your subject guide is available for download. By understanding how the interview works and, crucially, what it is that the interviewer is looking for. The interviewer is not looking to catch you out, but rather for you to demonstrate your curiosity, knowledge and passion for PPE. The easiest way to demonstrate your enthusiasm for PPE is to show that you are self-motivated and have studied the subject in your free-time for enjoyment – for example through online lectures and independent reading. If you don’t know where to start, review our suggested reading list below. See also Economics and Philosophy Practice Questions. Is there essentially any difference between taxation and the state taking away one of your arms? Do you really consent to any government given that there is barely anywhere in the world to escape some government or other? Differentiate between power and authority. Can you imagine a place without Politics? Is it a matter of fact or knowledge that time travels in only one direction? How do you know I exist? Can God ever be known? Show the difference between these words: novel, radical, total. Would you legalise all drugs? What is the difference between innovation and invention? Why do we need government? In a democracy, can the majority impose its will on the minority? Explain the AV voting system and the positive and negative effects it could have if brought in in the UK? What is federalism? How does it differ from the current British political system? How would you bring a population out of poverty? Are there always winners and losers in politics? What is freedom and how do you measure it? Why is there not a global government? Should there be an intelligence test to decide who could vote? Is it easier to predict the actions of groups rather than individuals? Should religious symbols be banned? What are your views on nature vs. nurture? How important is social interaction in language acquisition? How would you eradicate gender inequalities in society? Are sociological theories just evaluations of one another or can they stand alone? If all countries have nuclear weapons, would there still be wars? Instead of politicians, why don’t we let the managers of IKEA run the country? Should obese people have free NHS treatment? Distinguish between a society, a state and an economy? Is someone who risks their own life (and those of others) in extreme sports or endurance activities a hero or a fool? What do you think about the current British school system? Does a girl scout have a political agenda? If you were an anthropologist what aspects of British society would you study? Where do you think the Elgin Marbles should be: London or Athens? Why do humans have cultures? How does studying History link with Archaeology? How would you explain human culture to an alien visiting earth? If you had £500,000 to find out more about the origins of language, how would you spend it? What are the differences between Neanderthals and Homo-Sapiens? What is the significance of ceramics in present society? How would you define an archaeological layer? How would you conduct research on Aboriginal people in Australia? What is the role of archaeologists and museums? Distinguish between a society, a state and an economy. Do you think perception of colour is culturally specific? Give me an example of material culture in contemporary society. How are national borders drawn? How many people are in this room? How would you begin to decipher these cave paintings? If a psychopath gains true happiness from murdering people, should we allow him to kill people that truly want to die? Should a chimpanzee have human right.? Should happiness be the basis for morality? Some Neoliberals say that poor people are poor because they are lazy to work, what are your thoughts? What is current affair at the moment that you find particularly indicative of a world issue? What are the similarities between the Roman Empire and the UN? What are your views on the aid budget, and is it helping developing countries? What did you think of the most recent budget? If you were George Osborne, what would you have done differently? What do you first look for when deciphering a symbol? What do you think constitutes love? What is free will and how does that relate to the concept of the state of nature? Which is more influential – economics or politics? What is something you find interesting about the place you’re from and why? What is the difference between state and society? Which area of the world would you want to learn more about and why? Why has nationalism has strengthened in Europe in recent years? Will “Help to Buy” lead to the next credit crunch? 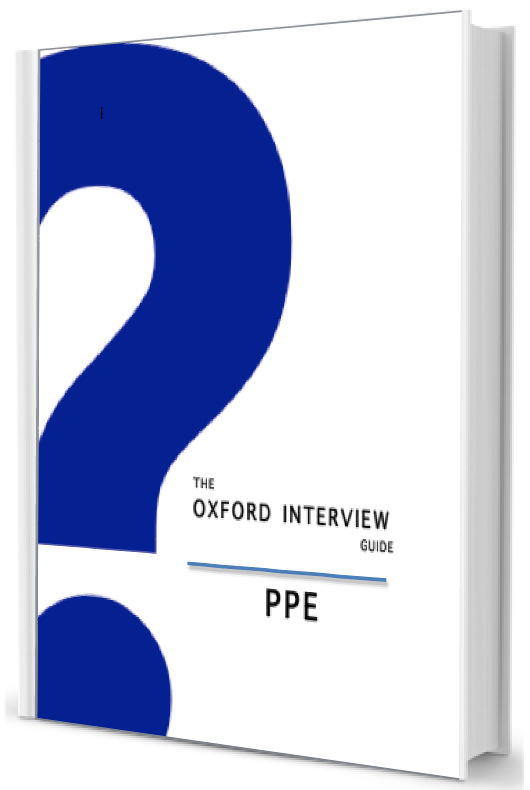 The PPE guide discusses twenty Oxford Interview Questions in depth with answers and approaches – along with possible points of discussion to further demonstrate your knowledge. They have been specially edited for applicants for each subject by a team of Oxford and Cambridge graduates.